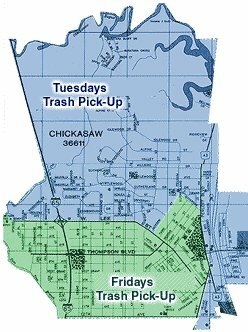 Garbage and trash service is provided under contract with Advance Disposal. North of Lee Street to West side of Jackson Street, North of Jefferson, East of Craft Hwy. South of Lee Street to East side of Jackson Street, South of Jefferson, West of Craft Hwy. If you are experiencing any difficulty with the waste pick-up, please call Advanced Disposal at 443-8555 or City Hall at 452-6450.